TWO world-class riders from the United Arab Emirates headline overseas entries for the Cradle Mountain Chateau Tom Quilty Gold Cup at Sheffield next month. The Tom Quilty, Australia's premier equine endurance event, will be held over a challenging 160km course, starting at midnight on June 10. Abdullah Kharis Ali Saeed, a former world record-holder, and Uousef Ahmed Al Bloushi will be the two Arab riders in a field of more than 120. There will also be five Japanese riders and one from the United States. The Arabs, American and one of the Japanese will ride horses supplied by Toft Endurance from Queensland. Ali Saeed has already competed in a Quilty, and is the first Middle East rider to get a Tom Quilty completion buckle when he placed seventh at the 2000 event. He is ranked as one of the best endurance riders in the world. In 2000, he won the inaugural 160km H.H. The President of the UAE Millennium Cup in the UAE, breaking the world record for the distance in a time of seven hours, 49 minutes, 13 seconds. However according to Peter Toft, of Toft Endurance, who is supplying his mount Abdullah "will ride to suit the conditions", ensuring he is a serious contender on the Sheffield circuit. His mount, BBP Electra Murdoch is now ranked Australia's No.1 endurance horse. Murdoch carried Toft in the Tom Quilty Gold Cup in South Australia last year, where they won first heavyweight and heavyweight best conditioned. Al Bloushi finished third in the FEI national championships on his first trip to Australia last year. Three-time winner Victorian Meg Wade and last year's joint winner Joyce Corbett, of Queensland, will also participate. Skillman Campground will be the site of the sixth annual Wild West Endurance Ride through the Tahoe National Forest this weekend. One hundred riders are expected to saddle up for 30- and 50-mile loop journeys out of the campground Saturday, Sunday and Monday. QUEENSLAND ? An Australian based endurance horse owned by General Shaikh Mohammed bin Rashid Al Maktoum, Crown Prince of Dubai and UAE Minister of Defence, scooped the coveted award for Best Condition in the 160-km 3-Star FEI ride at Gatton in Queensland recently. His eight-year old Arabian gelding, Jordanvale Red Cloud, ridden by Kristie McGaffin, a member of the Australian slver medal team, narrowly missed winning the ride by a mere nose. The crews and spectators saw two riders emerge out of the darkness holding hands as they rode the last few metres. 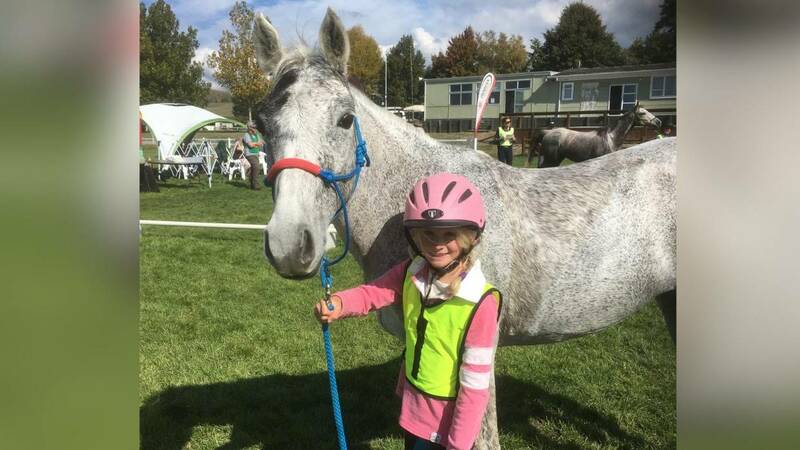 In true racing fashion the grey mare China Doll stuck her nose out as she crossed the finish line to claim first place for her rider and owner Meg Wade. WORLD champion Shaikh Hazza Sultan Al Nahyan of the United Arabs Emirate will start as favourite in the main 160km event tomorrow at the ar-Raudhah Equine Centre in Kuang. Shaikh Hazza is one of the six riders from UAE who is participating in this gruelling event. The others are his brother Shaikh Khaled, Majed Ali Al Kayoumi, Musaid Mohammed Al Mahrami, Tayef Ateeq Sabt Al Falahi and Khamis Ateeq Al Romaithi. Taj Mahal easily stands out among his competition. And it's not just because he hasn't been out of the top 10 in his three years of 50-55 mile endurance races. The 17-hand, 8-year-old thoroughbred mule is a rarity among a field dominated by Arabians. "Some of the other riders are not happy with me, especially the Arabian people," says Taj's owner Doris Roesch, who has eight of her own Arabians. At one race, Roesch stuck with a group of riders near the front and could tell that one woman in particular was extremely annoyed. As the woman's horse tired, Taj Mahal passed her. When they got to the watering hole, the other rider came up from the behind, screaming, "Get that mule out of the water tank! My horse won't drink with him in there!" On Thursday, January 27, HH Sheik Hazza Bin Sultan Bin Zayed Al Nayan (UAE) won the FEI Endurance World Championship 2005, 160 km in Dubai. He was riding Hachim, FEI Passport No ESP 02734. The MCP (Medication Control Programme) Team selected Hachim for sampling as well as 9 other horses participating in the championship. Friday, January 28: Gulfnews praised Sheik Hazza Bin Sultan Bin Zayed Al Nayan?s ?golden decision? to switch horses shortly before the championship. He was supposed to ride Shahdon, formerly ridden by two-time world champion Valerie Kanavy. Instead he opted for Hachim, the horse he rode to victory in Bahrain. The championship was ? according to Gulfnews and Khaleej Times ? the first-ever 160 km ride for Hachim. Saturday, January 29: About 15 minutes before the official prize giving ceremony, held at Lisaili Fort off the Dubai-Al Ain highway, the French Team was informed that 2nd placed Barbara Lissarague/ Georgat will be declared the individual winner of the FEI World Endurance Championship instead of Sheik Hazza, because traces of performance enhancing drugs seem to have been found in the sampling of his horse Hachim. 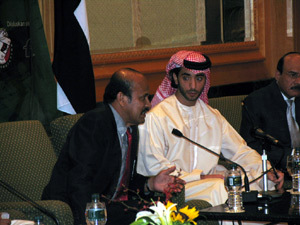 Sheik Hazza, who was present for the closing ceremony, left midway after being informed about this decision (according to gulfnews). Barbara Lissarague/ Georgat (FRA) was then awarded the gold medal and declared world champion. They will come from as far as the United Arabs Emirates, the USA, Australia and Brunei to ar-Raudhah Equine Centre in Kuang, Selangor to pit their skills and strategies in the grueling CEIO 3* 16o km Ride of the Edaran Endurance Classic 2005, come Saturday, 21 May. ar-Raudhah Equine Centre, Kuang, Selangor, Malaysia. Following two successful endurance events held in 2003 and 2004, Edaran Digital Systems Berhad (EDARAN), a Company involved in Systems Integration and Smart Technology Solutions in Malaysia, has scheduled the third endurance competition, Edaran Endurance Classic 2005 in May this year. Last year?s Edaran Endurance Classic had edged up a notch when it achieved FEI-CEI** certification for its 120Km Ride, a commendable achievement after just one competition event at ar-Raudhah in 2003. This year, the Edaran Endurance Classic 2005 will further step up the challenge for participants with a full 160KM ride as the main competition event. A second competition event is set at the 85Km distance and a third at a 40Km distance. A non-competitive event for Young Riders is set at a 15Km distance. Edaran Endurance Classic 2005, as with the first two Endurance Classic events, will be held at the tranquil and picturesque setting of ar-Raudhah Equine Centre in Kuang, Selangor, just 40 minutes north of Kuala Lumpur , Malaysia. ar-Raudhah Equine Centre and its surrounding region offer challenging but interesting trails through secondary jungles, lush wooded areas, gently undulating to hilly terrain, oil palm plantations, rubber estates and village settlements as well as pockets of water crossings. Malaysia?s endurance landscape which generally reflects Malaysia?s out-of-city topography, contrasts well with the desert landscape of the Middle East countries or rugged outbacks of Australia where endurance riding, in the two countries have become a sophisticated and well developed sport. For the first time, Edaran Endurance Classic has opened the competition to international participants with the aim of creating greater international awareness of Malaysia as an endurance riding venue as well as to further elevate the status of the sport in Malaysia. The Edaran Endurance Classic 2005 anticipates Riders from United States of America, United Arab Emirates, Australia and Germany. From within the country, at least 100 participants including the HRH (Duli Yang Maha Mulia) Al-Sultan Mizan Zainal Abidin of Terengganu, an avid and keen endurance rider, are expected to take part in this year?s competition. The Edaran Endurance Classic 2005 will stretch over three days from 20 May till 22 May, starting with veterinary checks of the horses and technical briefing to participants on Friday, 20 May. ?Endurance riding is a relatively under-exposed equestrian sport in Malaysia. Compared to the more visible and popularly promoted equine sports of Polo, Dressage and Show Jumping, endurance riding has yet to gain awareness among our younger Malaysians. Edaran Endurance Classic was initiated with the aim of promoting and developing the sport to a level where it can bring tangible benefits to the country and to our potential endurance sportsmen and women,? said Dato? Haji Abdul Hamid Mustapha, a Director of Edaran Digital Systems Berhad (EDARAN) and Organising Chairman of the Event. Recognising the sport?s potential we have, with the support and help of Equestrian Association of Malaysia, introduced for the first time, an event for Young Riders. The Young Riders? 15Km Ride will serve to encourage endurance enthusiasts to pick up the sport early and grow with it. 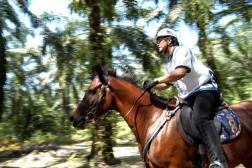 Endurance riding is one equestrian sport that holds tremendous potential for Malaysia. We believe it is one sport in which Malaysians can excel in, given that we have ideal sites and venues for training in the sport. Apart from that, we also believe that endurance riding can contribute significantly to sports tourism,? added Dato? Hamid Mustapha. The Edaran Endurance Classic 2005 is organized with the support of the Ministry of Youth and Sports and the Ministry of Tourism, Malaysia. Other supporting organizations include Equestrian Association of Malaysia, Malaysian Endurance Riding Society, Majlis Ekuin Malaysia, TV3 as official broadcaster, Skuadron Istiadat Berkuda, ATM, Unit Berkuda Polis Diraja Malaysia, Universiti Putra Malaysia Fakulti Veterinar, Jabatan Bomba dan Penyelamat , Dewan Bandaraya Kuala Lumpur and Carisbrook as Official Apparel. 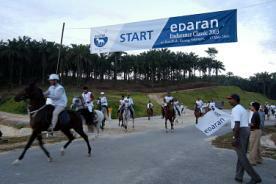 The Edaran Endurance Classic 2005 will be held from 20-22 this May at ar-Raudhah Equine Centre, Kuang, Selangor. The Event marks the third Endurance Competition organized by Edaran Digital Systems Berhad. The inaugural competition event was held in 2003 with distances of 80Km and 60Km. At the second Edaran Endurance Classic in 2004, the event achieved CEI-FEI** recognition for its 120Km event , a commendable achievement after just one competition event at ar-Raudhah Equine Centre. This year?s competition pushes up the challenge for participants with a full FEI-CEI*** 160Km Ride. The 160 Km Ride will be made up of six phases of 35 Km, 35 Km, 25 Km, 25 Km, 25 Km and a final loop of 15 Km. This competition category will however be qualified as an ?elevated ride? which in principal allows contestants of this event to opt to continue and finish the race at a distance of 160Km or choose to complete at a distance of 120Km. This decision has to be determined by contestants upon reaching the 95th Km distance of the race. A second event is set at the 80Km distance and a third event for new endurance enthusiasts is set at the 40 Km distance. The 85Km Ride will in turn be broken into three phases of 35 Km, 25Km and a final phase of 25Km. The 40Km Ride will comprise two phases which will be a first 25Km followed by a second phase of 15Km. The end of each phase marks a compulsory halt for veterinary inspection of their horses. The horses will be checked to determine their heart rate, gut sound, hydration level, lameness and overall physical condition. Horses that do not pass the stringent vet checks within the stipulated time are eliminated from the race as being ?Not Fit To Continue?. For the first time, Edaran Endurance Classic has opened the event to international participation and riders are anticipated from United States of America, Germany, Australia and United Emirates of Arabia. A total of 100 local riders including HRH, Duli Yang Maha Mulia Tuanku Al-Sultan Mizan Zainal Abidin of Trengganu, are expected to participate in this year?s event. Competitors of the Edaran Endurance Classic 2005 will be riding through a combination of six different trails ranging from distances of 15 Km to 35 Km trails. Trails will include those within and around ar-Raudhah Equine Centre. Trails outside of ar-Raudhah will take riders through surrounding village settlements, oil palm plantations and rubber estates as well as onto flat tarmac roads. Encik Mohamed Din bin Mat, the competition?s lead course designer said, ?The competition this year will pose more challenging for riders as the distance is not only longer but involves night riding as well. We nonetheless believe that the trails will proof to be exciting, challenging and enjoyable for the riders.? Britain will not host the FEI Emirates International Endurance Open European Championships, which were planned to take place at Alfred's Tower on the Stourhead Estate in early August. The International Equestrian Federation (FEI) is now looking at rescheduling the championships somewhere else. The organising committee decided to cancel the event yesterday (Monday 9 May), after consulting with the FEI, the British Equestrian Federation and title sponsor Emirates International Endurance Racing (EIER). Had the event gone ahead it would have been the second time in the championships' history that it had been held in Britain. cancel the event to be held in August. given up many days of time and effort to help in this venture?. finalise arrangements at this time. QATARI rider Abdulla Al Mirri clinched the seniors race and Shaikh Saqer bin Khalid Al Khalifa the juniors title in the season-ending Endurance Horseride Championship at the Endurance Village premises in Sakhir. His Majesty Shaikh Hamad witnessed a section of the race and hailed Bahrain efforts in hosting such top-level endurance races. Abdulla clocked four hours, 37 minutes and 14 seconds in the four-stage event over 100 competitors. More than 45 riders from Bahrain and other GCC countries took part in this race. Saleh Al Katheer (4:43:36) of Saudi Arabia was second and Qatar's Ahmed Al Malki (3:33:59) third. Bahrain Royal Equestrian and Endurance Federation's (Breef) first vice-president and Al Khaldiya team leader Shaikh Khalid bin Hamad Al Khalifa finished sixth. Breef president Shaikh Nasser bin Hamad Al Khalifa pulled out of the race after the second stage when his horse Free Lance failed to pass the veterinary examination. A total of 28 riders took part in the five-stage 120-km juniors race which was won by Shaikh Saqer of Ahmed Al Fateh Stable. He finished the race in six hours, 23 minutes and 35 seconds. Shaikh Saqer was followed by Mohammed Al Thawadi (6:44:50) of Al Asayel Stable in second place and Khalid Al Attiya (7:04:31) of Qatar was third. RIDERS from Bahrain and the GCC are set for today's season-ending Endurance Horseride Championship starting at 5am at the Endurance Village premises in Sakhir. Organised by the Bahrain Royal Equestrian and Endurance Federation (Breef), the event consists of races for seniors and juniors which are over 100 km and 120 km respectively. Breef president Shaikh Nasser bin Hamad Al Khalifa will lead the riders in the seniors event which consists of four stages while one more stage was included for the juniors race. Championship in Dubai last January. prohibited substance according to FEI Rules. ordering a new Official Award Ceremony to be held. the FEI World Endurance Championship held in Dubai on 27 January 2005.
locomotor system and is graded 3 by the Medication Sub-Committee of the FEI. has a relative low potential to affect the performance of the horse. Committee at a later stage. DUBAI ? The spectators were treated to a spectacular racing finish as a trio of Australia?s leading riders galloped to the finish in an endurance ride in Australia recently. The gutsy little stallion Al Mahzoz, owned by General Shaikh Mohammed bin Rashid Al Maktoum, Crown Prince of Dubai and UAE Minister of Defence, ridden and trained by Meg Wade, produced a brilliant burst of speed to win by a head.